The squads have been confirmed for the 2019 Super 3 season, with a number of new faces in the camps as well as some more familiar ones. Despite their retirements from the international scene, the Joyce twins and Clare Shillington will continue to participate. Indeed Shillington will be player-coach of the Dragons, for whom Pembroke all-rounder Kim Garth will be at the helm. “The Super 3’s is vital for the development of women’s cricket in Ireland," said Garth. "The next step up from the competition for us is international cricket, so the more competitive the competition can be, the better it will enable us to be competitive at an international level. “Last season it was exciting to see Lara Maritz step up when the Dragons really needed her - she bowled really well and produced consistent performances, so I’m excited to be playing with her this year. Shauna Kavanagh led the Dragons to the title in 2018, but has transferred to the Scorchers for the 2019 season. “Quantifying the importance of the Super 3’s competition is difficult in that the impact and contribution the competition has already had - and will continue to have - for women’s cricket in Ireland is huge. One of the key contributions is the expansion of the existing player pool capable of progressing to the international stage. There have been some really impressive players coming through over the last two years partially resulting from the opportunities that the competition provides. “I am looking forward to the fresh challenge the 2019 competition brings with the new structure of the squads. It gives individuals the opportunity to play against new opposition as well as the opportunity to learn from new individuals within their own squads. I am also excited to see the standard of this year’s competition given the strides it continues to make year on year. “Lara Maritz and Louise Little are players to watch out for this year. They are both young quick bowlers with huge batting potential, and they both have a lot of ability and ambition. I imagine they will both be key performers for their squads this year. Irish international skipper Laura Delany is at the helm of the Typhoons and eagerly anticipating the new season. 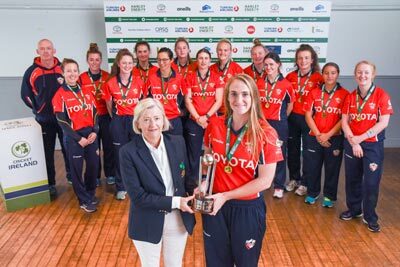 “I am looking forward to seeing how these players progress over the course of the summer, particularly the likes of Louise Little and Orla Prendergast, who both stood out in under-age cricket last season and I’m sure will be keen to make their mark again." The competition begins on May 19th, the week preceeding Ireland's series against West Indies, but no further details on any fixtures have been released at this stage. Kim Garth (Captain), Aoife Beggs, Aoife Brennan, Ava Canning, Alana Dalzell, Rachel Delaney, Anna Kerrison, Jane Maguire, Lara Maritz, Staci Maxwell, Eimear Mullen, Cliodhna O’Reardon, Clare Shillington, Jenny Sparrow, Kerry Tomlinson (overseas), Erica Turner, Mary Waldron, Sarah White. Coach: Clare Shillington. Shauna Kavanagh (Captain), Sadhbh Breslin, Sarah Forbes, Jennifer Gray, Jennifer Hanna, Cecelia Joyce, Isobel Joyce, Amy Kenealy, Ali Keenan, Gaby Lewis, Hannah Little, Sophie MacMahon, Tess Maritz, Caoimhe McCann, Cara Murray, Mya Naughton, Lucy O’Reilly, Rebecca Stokell. Coach: Andrew Poynter. Laura Delany (Captain), Aisling Byrne, Sarah Condron, Zara Craig, Amy Hunter, Vanessa Kelada, Maria Kerrison, Anna Kirk, Robyn Lewis, Louise Little, Naomi Matthews, Leah Paul, Orla Prendergast, Celeste Raack, Una Raymond-Hoey, Cassie Stephens (overseas), Cliona Tucker, Niamh Walsh. Coach: Tim Simmonite.